After decades of apartment living, one of the things I was most excited about when Robert and I bought our home last year was finally having my own outdoor patio. Although we were heading into winter when we moved in and wouldn’t be able use it right away, I spent all winter and spring imagining myself lounging outside on the patio in the summer with a book and a delicious cocktail. As summer approached, I realized that our patio gets unusually hot. It’s great for morning coffee and perfect for evening cocktails, but step outside in the middle of a warm, sunny day and you’re wilting within minutes. My patio my be too hot for the summertime lounging that I had imagined, but it turned out to be ideal for growing my first crop of tomatoes. I had never grown tomatoes before so I knew I was going to need some help. Early in the summer, my mom and I headed to the nursery to pick up supplies and tomato starts. I chose three varieties: Sun Gold, Carmello and Matina. Sun Gold was an obvious choice. Everyone in Seattle grows these cherry tomatoes and for good reason. They grow well here and are amazingly sweet with an irresistible tropical flavor. Carmello, a French variety, is a basic red slicing tomato. My last choice, Matina, was perhaps most interesting to me. With its unusual potato-style leaves, the Matina is a small red tomato with a flavor said to rival that of the larger beefsteak. It ripens early and often making it a great choice for our cool Pacific Northwest climate. I planted the tomatoes on my birthday in mid-June and then sat back and hoped for the best. I can’t say I took great care of them. I learned a little too late about this stuff called “fertilizer” which is supposed to be helpful, and I probably over-watered at times and under-watered at others. My attempts to keep the tomatoes tied to bamboo stakes in an orderly manner were sub par at best. The tomato plants held in there, though. Watching them grow taller and bushier and then sprout beautiful yellow flowers which later turned into tiny pea-sized fruit made me happier than I had anticipated. However, when August started and I still didn’t have any ripe tomatoes, I started to worry. 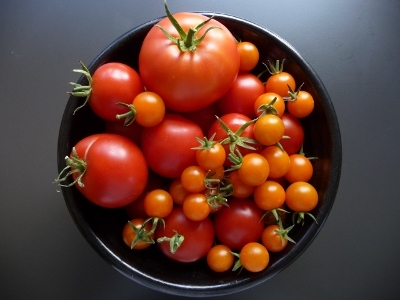 The summer had been cooler and grayer than usual—maybe I wouldn’t have any tomatoes at all! After so much anticipation, three Sun Golds were finally ready. I brought them inside, gently sliced them into halves and carefully set them on top of a salad. They were the most delectable tomatoes I’ve ever had! Ten days later, I had my first ripe Matina. It was about the size of a golf ball, perfectly round and with a striking red color. I served this in a salad as well. Unlike the Sun Golds, which have their own unique floral flavor, the Matina tasted more like a traditional tomato (a super-delicious traditional tomato). I found that I prefer the smaller size of the Matina compared with a regular tomato—it’s small enough that you can quarter it for salads but still large enough to be sliced for sandwiches. One by one, my tomatoes were finally starting to ripen. Then, we hit a patch of nice weather and things got crazy. Suddenly we were faced with an overabundance of tomatoes, more than any normal person could handle. We had treated our first few tomatoes like rare, precious jewels. Now we considered throwing them at passing cars for fun. I gave them away to family and co-workers, but that still barely made a dent. Just when I thought I had a grip on things, I’d step outside and see even more tomatoes ripening! Tough life, I know. While the Sun Golds and Matinas were numbering into the hundreds, the Carmellos were a disappointment. I only harvested a few ripe Carmellos and half of those had sun scald. They were also my least favorite tomato flavor-wise. I know lots of people love Carmellos, but they didn’t work out for me this year. Our cooler-than-normal summer really favored tomatoes with a shorter growing season such as the Sun Golds and Matinas. As for what I have done with all of these tomatoes? What haven’t I done! BLTs, salads, salsas, soups, tomato tarts and broiled tomato sandwiches—we’ve been sneaking tomatoes into everything. At one meal, in very Top Chef fashion, we had tomatoes served “two ways”. One of the best dishes I made was pasta with clams and Sun Golds—with a chilled glass of wine and some simple steamed green beans, it was a perfect summertime meal. I frequently resorted to slow-roasting tomatoes in a low oven, a great way to reduce a lot of tomatoes to a small pile of sweet tomato candy that can be used in a million different ways (we enjoyed it over pasta and on crostini with goat cheese and basil). Desperate for yet another way to use the tomatoes, I looked to my other favorite pastime: cocktails. Sure enough, the Internet provided plenty of ideas. I tried the Sun Gold Zinger, a gin based drink featuring muddled Sun Golds and lemon juice. Somehow it tasted exactly like fresh-squeezed orange juice. Now that the season is coming to an end, I’m turning my attention to recipes for green tomatoes. I probably have enough unripe tomatoes left to make a few batches of salsa verde and maybe, if I’m feeling adventurous, a green tomato pie. I spent all of last winter imagining myself lounging on the patio during the summer. This winter, I’ll be dreaming about what next summer’s tomato crop will look like!